Designed with designers in mind. While they’re a must-have item for designers and architects, rulers have largely remained the same over the years. Stockholm-based Allon Libermann and Hye Jin Ahn have recently created their own take on this essential tool. 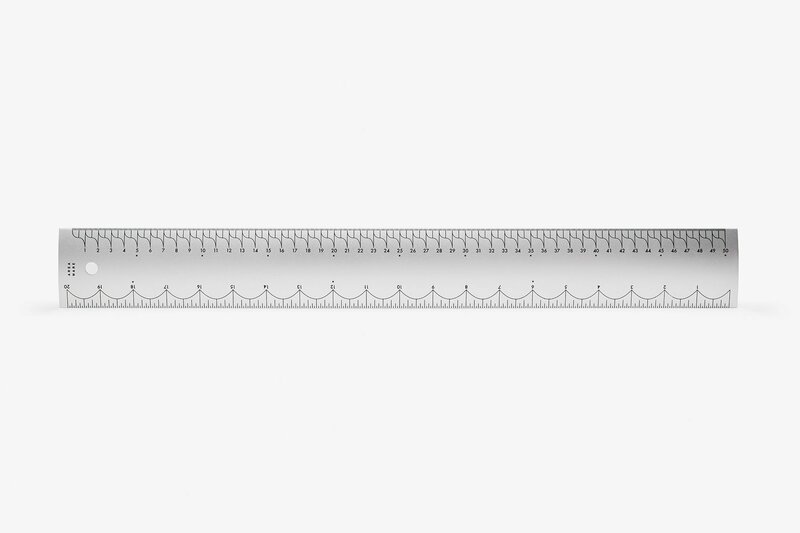 Designed for gift and home accessories brand Areaware, this aluminum ruler for designer studios and other creatives uses ingenious strategies to make taking a measurement easier. It features curved lines as well as bright red dots to increase legibility and streamline the process of measuring items. Crafted from lightweight aluminum, the ruler boasts black lines on light silver gray, marking both whole and half numbers. The curves unify the sections that make up a whole number in an elegant way. They also change inflection halfway between the numbers to enhance legibility. Red dots mark large integers to make them stand out, even at a glance. Of course, the ruler features both inch and centimeter units of measure. A practical hole at the top provides the perfect solution to hang the aluminum ruler on a hook on a wall. That way, the user can keep it on display and close at hand in a creative work space. Buy here.